With chia, poppy, and toasted sesame seeds, this bread smells delicious and is full of flavor. The crust is crackly and the crumb is soft and chewy. This bread looks great, Melissa. I like the idea that the seeds compensate for the lack of germ and bran in the white flour. I’ve never thought of it that way. I won’t have to feel guilty about using white flour! Thanks! So nobody should feel bad about not eating organic or good because they do. I’m glad the seeded sourdough recipe can give you some relief from no-bran-germ guilt I hear you. At one point I added together the grams of fiber from the various tablespoons of seeds. 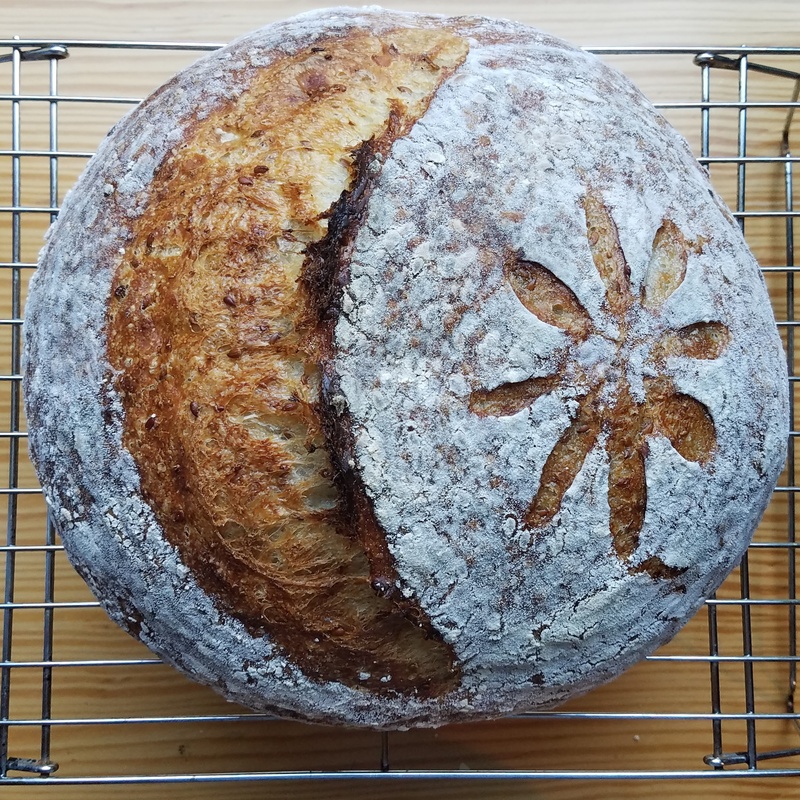 Then I remembered the seeds on the crust, which I didn’t measure carefully, and I certainly didn’t keep track of how many stuck to the dough and how many stayed on the kitchen counter…so I abandoned the idea of providing fiber content for the loaf. This recipe sounded so delicious I decided to make it yesterday. I have only one problem with this bread…it’s almost gone! Delicious and a big hit with everyone who tried a piece - or three. I will definitely make it again soon and look forward to experimenting with different types of seeds. So happy to hear you had a good experience with the recipe - thanks for sharing! In the recipe, it was stated to begin a series of 4-6 stretch and folds 20-30 minutes apart, but for how long ? Thank you, I would love to try this recipe. I tend to give a flexible range because the dough can take it and people need it. If you do 4 stretch and folds at 20 min intervals, you’ll be done with this stage in 1 hr (0, 20,40,60). Good for a busy day. 6 s&f at 30 min intervals and you’re looking at 2.5 hours. Is longer better? Perhaps, but not always. Pay attention to the growing elasticity of the dough but don’t worry too much if you have to cover the dough and go somewhere at 3 s&f’s. 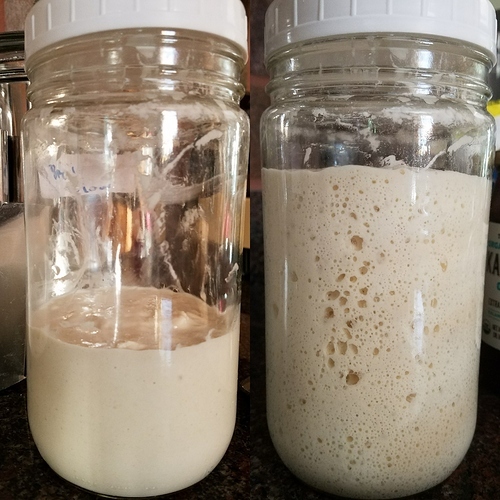 The leaven in this recipe, do you mean 100% hydration starter or do we build the leaven with our starter first like tartine? Make sure your starter is active and floating, close to its peak. If I bake frequently, my starter is like this in the fridge. If I take a few days off, I have to build it. I forgot to confirm. Yes approx 100% hydration. Here are two photos I took for fun this morning. My starter pulled out of fridge and fed and my starter a few hours later (3.5) - ready to use. I’ve made a similar bread for several years, using toasted pumpkin, flax and sunflower seeds. Toasting all the seeds gives the bread a nice kind of smokey flavor. I also put in 1 Tbsp. 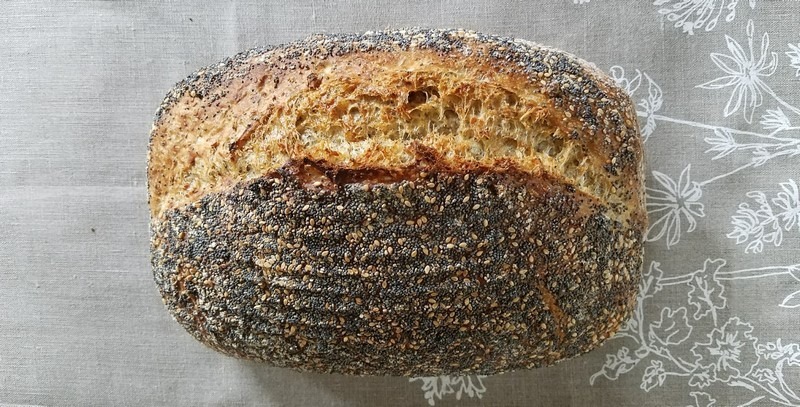 honey (Brazilian honey, which has a kind of flower taste to it), which doesn’t sweeten the bread, but gives it an interesting nuance, and I think helps boost the action of the yeast in the starter. That sounds like a great combination. I agree about toasting the seeds - nice flavor and aroma too. What a revelation when I learned I could do it in a skillet in 2-3 minutes! Question about the omega-3s and omega-6s in this recipe. You link to a journal article on the value of keeping a high ratio of Omega-3 to Omega-6 in the diet. That’s fine, I’ve seen that elsewhere and it probably makes sense. And you tout the good ratio in chia seeds, which you call a “superfood”. Well, um, that’s a flourish, but OK.
And indeed your link to chia’s nutritional profile shows a good ratio: In 1 oz, you have Total Omega-3 fatty acids 4915mg, Total Omega-6 fatty acids 1620mg, so a 3:1 ratio. So far so good. So I look up the poppy seeds you use in equal measure, and darn, the numbers don’t look good: Total Omega-3 fatty acids 76.4mg, Total Omega-6 fatty acids 7921mg. That’s a lot of Omega-6. Next, I look up roasted and toasted sesame seeds: Total Omega-3 fatty acids 102mg, Total Omega-6 fatty acids 5784mg. Is this what you had in mind? It seems to me that a person wishing to hit a good ratio of Omega-3 to Omega-6 would stick with chia seeds and leave out the others. Yes, only using chia seeds would be better for achieving the ratio. Another option is chia and flax seeds. That’s very interesting. I see that hemp doesn’t have a good ratio, so maybe that “superfood” label fails again. This discussion inspired me to look at the omega balance in whole grain flour and all-purpose flour, which is enlightening. Whole grain has the bran and the germ, both of which have unfavorable ratios. Whole grain flour has 1093 mg of omega 6 per cup, while all-purpose is only 391 mg per cup. Whole grain has 73 mg of omega-3 per cup, while AP is 22 mg. So an AP bread recipe fortified with chia and flax gives you more omega 3 than a whole grain loaf without the seeds and a much more favorable ratio of omega 3 to omega 6. And it tastes better and has better crumb. So the idea that we all need to eat minimally-processed foods as nature provides them isn’t really such a great idea after all. My next loaf is gonna have chia, flax, and AP flour. I do think whole grains have a lot to offer in other aspects of nutrition. The Omega 3:6 ratio is important but so are various minerals and fiber. Someone once said, “Nutrition is a symphony,” which I take to mean, “a variety of nutritious foods will likely make for good outcomes.” I originally wrote “nutrient dense,” but I edited it to be nutritious because, I don’t believe everything I eat has to be nutrient dense. For example, I probably eat a head of celery a week, which is mostly fiber, water and salt. But I think it is part of my symphony. 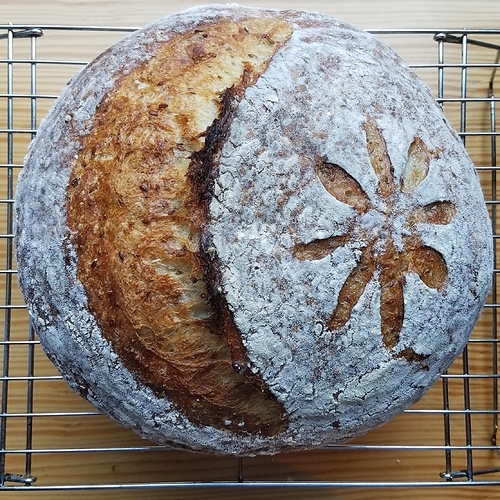 Your bread plan of white flour, chia and flax seeds sounds amazing though. I’ve a gift bread to make tonight and maybe that’s what it will be. I did a long cold bulk fermentation (18 hrs) with everything in at once, followed by 6 hrs at room temp with a couple of stretch and folds to even out the temp of the warming up dough. Shaped and back in refrigerator to proof 2.5 hrs in fridge. Wish I could taste it but it’s a gift. Smells great! How long should the stretch and fold process be? Recipe doesn’t say. If you do 4 stretch and folds at 20 min intervals, you’ll be done with this stage in 1 hr (0, 20,40,60). 6 s&f at 30 min intervals will take 2.5 hours. As I wrote above to another person with a similar question: Pay attention to the growing elasticity of the dough but don’t worry too much if you have to cover the dough and go somewhere at 3 s&f’s. –i like to flour my hands and flip the dough onto one hand, gently lay it in the hot pan (careful!). I sometimes use a butter knife to push the dough around after transfer. This is not typical but I like that I can peel the dough with fingers if needed if it’s a bit stuck to the basket. –your basket and tea towel can be floured with a mix of half all purpose and half rice flour or bran flakes to decrease stickiness. Not sure if this is part of your issue. –consider using parchment paper in your basket and transferring the dough with the paper to the baking vessel.